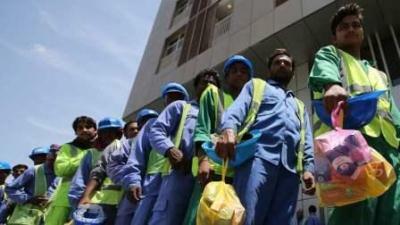 The UAE continues to work closely with countries of labourers' origin to improve protection to workers who are at the risk of abuse beyond borders, a UAE minister said after launching a report that highlighted the UAE's improvement in labour welfare and domestic law. Nasser Thani Al Hamli, Minister of Human Resources and Emiratisation, said the ministry is engaged with the Philippines in developing an innovative pilot programme to strengthen government oversight into the recruitment process to enhance ethical recruitment. It is also in contact with the Philippines and Sri Lanka to try new approaches to the provision of information to workers, pre-employment, pre-departure and post-arrival. Celebrating International Labour Day on Tuesday, the Ministry of Human Resources and Emiratisation (MoHRE) launched the 2017-2018 Worker Welfare Report, revealing that the UAE has achieved higher protection and better dispute resolution for labourers over the past years. "Through the Abu Dhabi Dialogue, the UAE continues to support work to empower workers through up-skilling and skills recognition, and implement technological solutions to strengthen governance standards," he said, calling for a labour market that "empowers Emiratis and attracts talent from around the world". The report comes at a time when the gulf region is facing scrutiny after the Philippines' permanent ban on Filipina domestic workers and labourers heading to Kuwait. The move inflamed a dispute sparked by complaints of the abuse of Filipina housemaids and labourers in the gulf country. The situation hit a snag back in 2014 when labour-exporting countries like the Philippines stopped deploying maids after the UAE Ministry of Interior introduced a unified contract for domestic workers that led to the suspension of consular offices' role in verifying and attesting contracts of maids. Philippine domestic laws stipulate the mandatory attestation of contracts as a security measure and to ensure that household service workers (HSWs) will receive a minimum monthly salary of $400 (Dh1,460). Indonesia, meanwhile, imposed in 2015 a deployment ban of domestic workers to all countries in the Middle East, including the UAE. Al Hamli said the report underlines commitment to transparency regarding efforts to improve protections for workers in the UAE. "The last two years have been particularly busy for the ministry, with a huge range of new measures put in place to ensure that the UAE is one of the best places in the world to work. Helping the UAE transition to a knowledge economy, through stronger protections, is crucial in achieving our Emiratisation goals." He added: "The release of this data is important in highlighting areas where there is room for improvement; but, I believe, it paints overall a positive picture of the action being undertaken to ensure that the governance of the UAE's labour market is rigorous, consistent and, above all, fair." Around 750,000 residents in the UAE work in domestic service, and the new regulations establish their rights and responsibilities. The UAE provides work to approximately one million new residents every year.